Take a guess at what is the number one cause of tooth loss in the United States. Did you say traumatic injury? That’s a good guess, but the foremost reason is gum disease. This bacterial infection destroys gum tissue, teeth roots and the bone structure underneath gums that supports your teeth. When the disease is too advanced, there may no other option except tooth extraction. When removing teeth is necessary because of gum disease, there is no better dental health professional for the task than a periodontist. 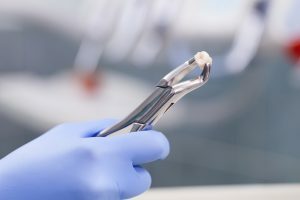 A periodontist will not only remove the tooth, but also be able to treat the damaged gum and bone tissue in order to stop the spread of infection. Of course, if injury or extensive decay makes tooth extraction necessary, a periodontist is still the one to trust. Once the periodontist has removed your tooth and treated for infection if present, he can then begin the process of replacement. Actually, this begins even before your tooth is removed. A periodontist can make a plan for tooth replacement as part of the preparation for extraction. This way, you’ll know that your complete smile will be restored. Tooth replacement after extraction is not only essential for your appearance, but also for your oral health. Just one missing tooth can lead to other dental problems such as decay, disease and shifting teeth. Knowing that you need to have a tooth extracted can be upsetting enough. However, by seeing a periodontist in Colorado Springs, you’ll be able to confidently take care of your oral health with one highly trained professional who will remove the tooth and provide the appropriate replacement. Call to schedule a consultation today. Rocky Mountain Periodontal Specialists are a team of periodontists offering excellence in specialized dentistry, including tooth extraction in Colorado Springs. To learn more about your options for tooth replacement or to schedule an appointment, please feel free to contact the office by calling 719-387-0464 today.